I'm home for a week in Indiana, on a last-minute trip... so what's a girl to pack? 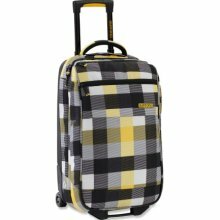 I packed my beloved Burton Wheelie Flight Deck for the trip. As I've said before, it's the Mary Poppins carpet bag of luggage. (I have the larger suitcase, the Double Deck, but didn't need it just for a week. When I'm going to be living out of a small bag for a while, I tend to pick one color palette... one that works with either black or brown accessories, so I don't end up with too many shoes. This trip, I chose black... so all of my dresses coordinate with my black flats or wedges, my tops are predominantly black/white, and my purses are both black. I chose silver jewelry, and that rounded out my planning. I tend to wear my 'biggest' pair of shoes on the plane, i.e. the bulkiest ones that would take space in my bag. So if I'm taking boots or running shoes, I wear those. I roll my clothes in my suitcase to prevent wrinkles and conserve space. ALWAYS save enough space to bring something back with you on your trip! I packed enough outfits that I can mix/match to last an entire week's stay. I've got options to dress an outfit up or down too. So that's what I look for in packing for a week in a carry-on bag. The Army has changed the way I travel! And since so many airlines are charging for checked baggage, it's actually a good skill to have.